Thinking of going solar? Prices are approaching the cost of grid electricity, but only in some places — so far. Many people ask when the cost of producing power from solar photovoltaic (PV) panels will be equal to or less than buying from the grid – a point called “grid parity” that could accelerate solar adoption. For example, electricity from utility-scale solar systems (typically large arrays where panels slowly change tilt and orientation to face the sun all day) usually costs less than electricity produced from solar panels fixed on someone’s home. Also, residential electric rates, on average about 12 cents per kilowatt-hour in in the U.S., are much higher than wholesale electric rates – the price utilities pay to power generators – which are usually less than 4 cents per kilowatt-hour. At the same time, different states have more or less sun – solar power in Florida is typically more economic than in Alaska, for instance. All of these factors make the question more complicated than people might anticipate. The levelized, or average, cost of electricity from a solar PV array is derived from all the money spent to buy, install, finance and maintain the system divided by the total amount of electricity that system is expected to produce over its lifetime. We call this value the Levelized Cost of Electricity (LCOE) and it’s expressed in terms of dollars per kilowatt-hour ($/kWh). The same metric can be used to determine the cost for a coal or natural gas plant. Planners like it because it reduces the cost of a power plant over a span of many decades into a single number. So how do we know how close residential solar is to grid parity where you live? Ultimately, that depends on two things: how much you pay for the electricity you buy from the local grid, and how much can you get paid for the electricity you can produce from PV. Let’s take a look at both of them. Electric rates vary a great deal across the country, and these differences could be caused by a number of economic, historical or regulatory reasons. 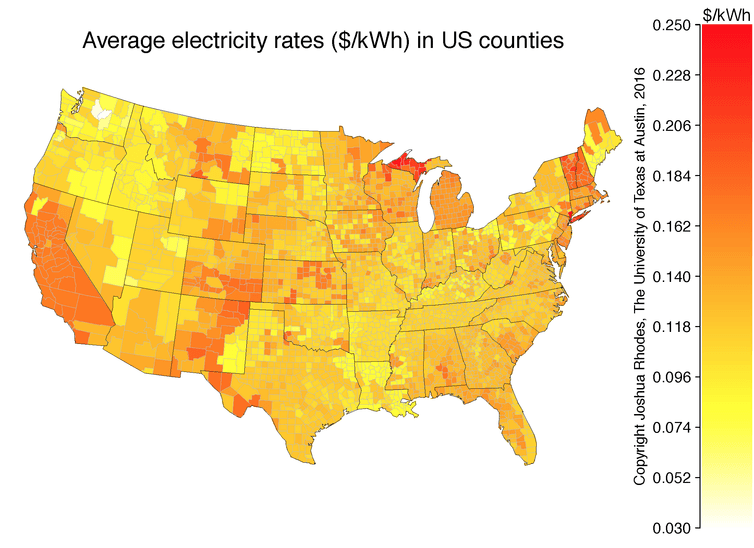 Likewise, the costs of solar and the availability of the solar resource (i.e., how often and how strong the sun shines) also are not homogeneous throughout the U.S. The figure below shows the LCOE of residential solar across all counties nationwide. The U.S. Department of Energy SunShot Initiative has a stated goal of lowering residential solar PV system installations to $1.50/Watt. Cheap PV panels from China have driven down the hardware costs to the point where the price of a total PV system is now dominated by “soft costs” – namely, customer acquisition, installation, supply chain, permit, etc. Still, total installed system costs continue to fall. To illustrate this point, we take the same information that underlies the solar cost map and reduce the total installed cost of installed solar in $0.50/Watt increments – from $3.50/Watt to $1.50/Watt (the SunShot goal). We can then subtract the electricity rate from the solar LCOE in every county. Where this difference is zero or negative (electricity rates > LCOE), we can estimate when that county will be at grid parity for residential solar PV. GIF showing the locations where residential solar LCOE reaches parity with local average electric rates at various solar installed costs. Joshua D. Rhodes, Postdoctoral Researcher of Energy, University of Texas at Austin. This article was originally published on The Conversation. Read the original article.